Today’s consumers are more demanding (and vocal) of the companies they buy from and increasingly able to tune out unwanted, out of context messages, offers and products that marketers try to push. Tomorrows’ successful B2C organizations will need to operate in a new era of marketing – where they engage with customers that will buy more, not because they are offered more, but because they are offered better products and services that are highly relevant and contextual from companies that are trustworthy and consistent. Strategies to master the complexity of channels and systems to achieve speed and scale. How to understand the customer’s individual context to differentiate at every opportunity? How to truly operate in real-time at every interaction on every channel? How to leverage best The Social Customer Experience wave? How to streamline & optimize national & global marketing initiatives? 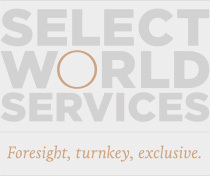 JOIN US for senior-level conversations, exchange of ideas and networking at Select World Services’ Exclusive, intimate, by invitation only CXO dinner – The Age of UnMarketing.